Our detailed review of Upwork- one of the biggest freelancers platforms (Foremly known and Odesk or Elance) which offers a easy way to find and hire professionals per project on various categories. This UpWork review covers one of the most generalized freelance sites out there. While you’ll find a large selection in their main categories—design, marketing, writing/translation, business, tech, engineering, and law—it is possible to post a project for virtually anything that can be done on a computer. Users can choose to hire from the general UpWork pool or through the UpWork Pro service which offers more highly vetted freelancers for hire. There is also an Enterprise membership which is designed for businesses and offers more support for hiring larger volumes of freelance work. All of these options, as well as price negotiation with each freelancer, combine to give an almost infinite combination of quality and price that will meet almost any virtual needs. 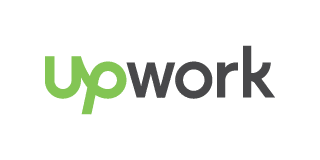 In 2015, UpWork was formed as a relaunch of two highly successful freelance platforms that dated back to the late 1990’s and early 2000’s, Elance and oDesk. The merger and rebranding of these companies has led to one of the largest online freelance sites in today’s market. As of 2017, the company reported over 14 million users and more than $1B in earnings for their freelancers each year. The process on UpWork is very similar to that of Freelancer and Guru, sites which fall into what we call the “dating” model. While there are some added features and guidance with UpWork Pro and Enterprise, the basic model is quite simple. Clients can post jobs or projects via a simple proposal that includes a title, a short description of the work, and an indication the desired budget. For fixed payment projects, this will be a dollar value, and for hourly projects, this will done by designating whether they are looking for Entry Level, Intermediate, or Expert level freelancers (in order from lowest to highest experience and hourly rates). It is also possible to include some screening questions if there are any specific attributes you need in a freelancer. After publishing the job, UpWork will suggest some members who might be a good fit, and you can invite them to send a proposal. Other freelancers can also search the job database and send proposals if they are interested. Once proposals start coming in, usually within minutes or hours of posting, the client can review proposals (which will include specific rates and general timetables) and freelancer profiles to look for possible good fits. Communication can be handled through the site in order to ask more questions and choose the right freelancer, at which point you can send a contract with the exact terms of the agreement. If payment is hourly, you will be charged at the end of each week for the hours logged the previous week. If the payment is in lump sums, then you can include milestones in the project which will be funded and paid out one at a time as they are completed. Both communication and payment can be conducted through the site systems to ensure security at all times. Our conclusion for this UpWork review is that this is a great choice if you are looking for an easy-to-use site to get some side projects done quickly. The lack of quality control means that you may have to weed through a lot of proposals, especially if you set a high budget, but if you’re willing to take a little bit of time to find them, there are definitely a lot of qualified people on UpWork. The diversity of services is also a huge plus, and even if what you’re looking for doesn’t exactly fit into any of their categories, you can still list it and invite people to apply. If your project isn’t too complicated, you could hire someone within a few hours to take care of it, and the chat and payment features are well-developed for this platform. UpWork also has one of the lowest fee rates (2.75%) with the added perk of being able to just pay a $25 flat fee per month if you’re planning to do a lot of hiring. Overall, UpWork is a great site that has a huge freelancer base to meet your needs.